In terms of initial product cost, electric tankless water heaters cost significantly less than their gas counterparts. Whole house electric tankless water heaters cost about US$500-700 where as gas tankless water heaters generally cost US$1,000 or more, especially for better quality systems with electronic ignition systems. This does not include installation - see below. While gas tankless water heaters are certainly more efficient than their tank cousins, their efficiency usually peaks at 80-85%. Conversely, most electric tankless water heaters are 98+% efficient. Even though natural gas is generally a cheaper input fuel than electricity per BTU of output power, this benefit is generally outweighed by the higher efficiency of the electric unit, longer service life, and cheaper installation. On top of that, electric tankless water heaters cost much less than most tankless gas models. Moreover, gas prices tend to fluctuate more dramatically then electricity prices and most economists agree that gas prices are expected to rise significantly in coming years, whereas in most areas, electricity prices should be relatively stable or at least rise at a much slower pace. Ongoing operating costs are obviously an important consideration. As a general rule, gas and electric tankless water heaters will cost approximately the same to operate, especially when you factor in the recommended annual maintenance that gas appliances require. This will depend greatly on the differential between natural gas or propane and electricity costs in your area. There are many regions where gas costs are extremely high due to the lack of supply in the region. In these areas, an electric unit can be significantly cheaper to operate. Remember, electric tankless water heaters are more energy efficient, so much of the cost difference between the fuels will be negated. Gas tankless water heaters have complex venting and combustion air supply requirements, especially when installed in a confined space. Existing gas lines and venting ducts often cannot be used. When side wall venting is required, it can get even more complex. Due to their high gas consumption, existing ventilation systems are rarely adequate. The bottom line, is that these requirements can make installation very expensive. Electric tankless water heaters are very small, about one third the size of a gas tankless water heater. As a result of their small size and the fact that they do not require ventilation of exhaust gases (because there are none), they can be installed in many locations where it is not feasible to install a gas tankless water heater. Accordingly, electric tankless water heaters can often be located closer to the actual point-of-use. They can be installed in a closet, under a sink, in a crawl space, or a wide range of other areas where a traditional tank or gas tankless cannot. Unless an electric system/service upgrade is require, the installation of an electric tankless water heater is generally much cheaper than the installation of a gas tankless water heater. 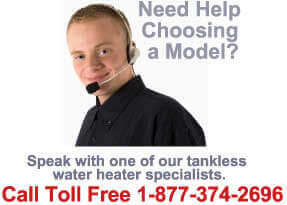 Electric tankless water heaters require very little maintenance. In fact, other than cleaning the inlet screen filter occasionally, electric tankless water heaters generally do not require any maintenance. On the other hand, gas tankless heaters should be inspected annually by a trained technician to ensure safe fuel combustion and performance. In the event of a problem, electric units are inherently simpler to troubleshoot, diagnose, and repair, and the simplicity of their design means that they tend to last a lot longer. Gas tankless water heaters have very complex heat exchangers and fuel controls that are much more difficult to service in the field. The availability of adequate electricity, natural gas, or propane, can obviously affect the decisions as to which type of tankless water heater is best for your home or business. Electric tankless water heaters are very high power appliances. Because they heat water entirely on demand, their peak electricity needs are substantial even though their total energy consumption is much lower than traditional tank-type water heaters. Consequently, it is often required that a home have a 200 AMP, 208 to 240 volt electrical service to run an electric tankless water heater (smaller whole-house models suitable for warmer climate areas can often be installed on 100, 125, or 150 AMP electrical services). Some homes or businesses do not have such electrical power available and upgrades can sometimes be expensive. On the other hand, the installation of a gas tankless water heater would almost certainly be uneconomical if the building did not have an existing natural gas or propane service, or if the diameter of the incoming gas line was insufficient (this is common). For most homeowners and businesses, their water usage patterns and needs will not affect their choice of what type of water heater they should select. Electric tankless water heaters can provide from 3 to 8 gallons per minute of shower temperature water depending on the model selected and climate (incoming water temperature). This is enough to meet the needs of most families. There are some gas tankless heaters on the market that are capable of larger demands in the case that unusually high flows are required. For safety reasons, some homeowners do not feel comfortable using natural gas or propane to power any of their household needs. In such instances, an electric tankless water heater is a better choice for peace of mind. Other homeowners may have preferences for one type for other reasons, including the availability of energy (electricity or gas) in the event of a major regional emergency such as a natural disaster. Still other users, may prefer one type over another for environmental reasons. Electric tankless water heaters are extremely energy efficient, with more than 98% of energy supplied to the units actually be used to heat the water. On the other hand, gas tankless water heaters generally have an energy factor of less than 85%. Gas water heaters of all types also contribute to greenhouse gas emissions. In conclusion, each homeowner should evaluate his or her own needs against the "pros" and "cons" of each alternative. Since we used to sell both tankless gas and tankless electric heaters, we have had the opportunity to help many customers evaluate the various options available to them, and the expected payback on their investment in a tankless water heater. Due to the high initial cost of a gas system (including installation), their inherent complexity and maintenance requirements, and shorter service lives and warranties, we found that tankless electric water heaters were by far the most economical choice for most of our customers. If you would like us to help evaluate your own particular situation, please call us toll free at 1-877-374-2696 and we will give you an honest assessment of whether an electric or gas tankless would be better for your needs.